This was the second to last mission for the Delta 4 medium. ULA will retire the vehicle later this summer after the launch of an Air Force GPS satellite. 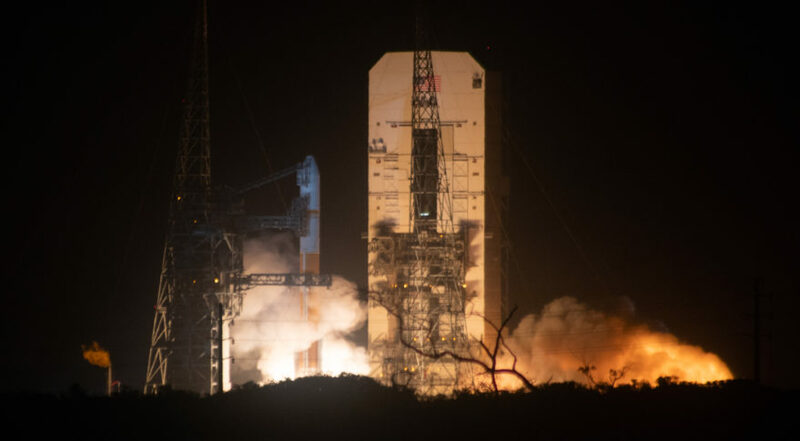 The U.S. Air Force’s 10th Wideband Global Satcom communications satellite (WGS-10) atop a United Launch Alliance Delta 4 rocket blasted off on Friday at 8:26 PM EST from Space Launch Complex-37B at Cape Canaveral Air Force Station, Florida. The Delta 4 medium “single stick” rocket — with one hydrogen-fueled common booster core, four solid rocket motors and a Delta Cryogenic Second Stage — lifted off after a delay caused by issues with NASA’s Tracking and Data Relay Satellite System. The tracking network must be available for liftoff to occur. The $424 million WGS-10 satellite encapsulated inside a 5-meter-diameter payload fairing marked the eighth flight of the Delta 4 in the medium configuration, all of which have been WGS missions. This was the 39th launch of the Delta 4 since it was introduced in 2002. It was ULA’s 133rd mission. The WGS constellation provides broadband communications for the U.S. military and allies. Boeing was selected as the WGS manufacturer in 2001. The first satellite was launched in 2007. Boeing delivered WGS-10 in November. On Feb. 26 it was hoisted aboard the 66.4 meters (218 feet) tall Delta 4 rocket. Gary Wentz, ULA’s vice president of government and commercial programs, said this was the second to last mission for the Delta 4 medium, which is being retired after the 25 July launch of an Air Force Global Positioning System satellite. ULA will keep the Delta 4 heavy — which has three common booster cores strapped together — until 2024. During a conference call with reporters, Wentz said ULA is taking the medium vehicle out of service to cut costs as the company tries to become leaner to compete against lower-cost providers. The WGS satellite weighed about 13,000 pounds at launch and its solar arrays once unfurled in space stretch 135 feet. The Air Force said the addition of a 10th satellite makes the WGS constellation the nation’s highest-capacity military communications system. It is operated by the U.S. Air Force’s 4th Space Operations Squadron at Schriever Air Force Base, Colorado. International partners participating in the WGS program include Australia, Canada, Denmark, Luxembourg, The Netherlands and New Zealand.